Cocker Spaniel is the smallest of the sporting dog breeds. The spaniel family of dogs is a very old one, dating back as far as the 14th century. Legend has it they got their name from their proficiency at flushing woodcocks. The breed as it is now known developed in the United States. To handle the hunting conditions in the U.S., the breed developed a shorter back and longer legs. Today, the American Cocker Spaniel is visibly a different breed from the English Cocker Spaniel. Cocker Spaniels stand between 13.5 and 15.5 inches tall and weigh between 24 and 30 pounds, with females smaller than males. The American Cocker’s face is one of the most recognizable in the canine world, with round, full, intelligent eyes, a rounded head, a broad muzzle, and hanging ears. The Cocker’s body is sturdy and compact; he is an athlete and should be ready for action at all times. The Cocker Spaniel coat is short on the head and mediumlength on the body. The legs are well-feathered. The acceptable colors include black, black and tan, cream, red, brown, and even parti-colors. The tail is docked. Grooming is a big part of Cocker Spaniel ownership. The silky coat requires daily brushing and combing; ignoring the coat will result in a matted mess. Many pet owners keep the coat trimmed short for ease of care. You will also need to check and clean the ears on a regular basis, at least twice weekly. The coat requires trimming every four to six weeks. If you wish to learn how to do this yourself, ask your breeder for guidance. If you would prefer not to do it, a professional groomer will be happy to help you. Cocker Spaniels are active dogs; bred to run in the field, they need a long, vigorous walk or a good run every day. Cockers shouldn’t be allowed to run free outside of a fenced-in yard, however, as many have retained their hunting instincts. If a rabbit or squirrel dashes past, they will be off after it. Most Cocker Spaniels enjoy a game of fetch and canine sports, especially agility and flyball. Early socialization is important. Although Cockers should be happy extroverts, some can be a little on the shy and fearful side. When they are introduced to a variety of people, other dogs, and the sights and sounds of the world, this tendency can be diminished. 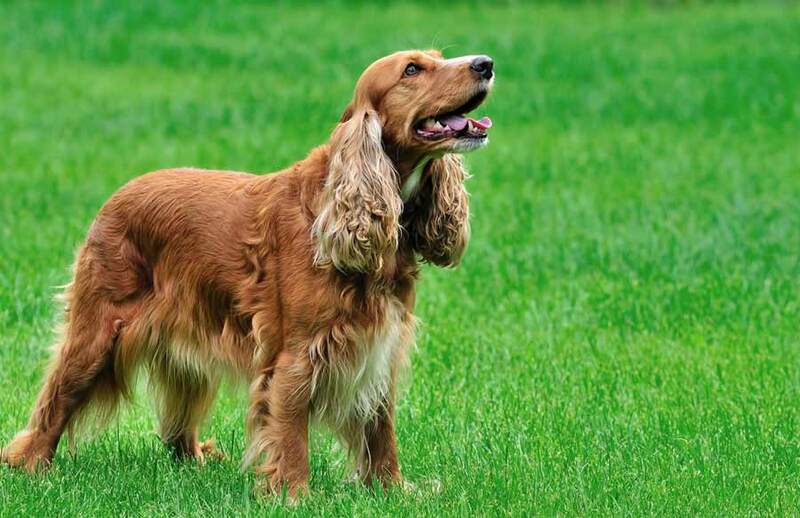 Training is important for both the Cocker Spaniel and his owner, as Cocker Spaniels are excellent at manipulating their owners. That wonderful head and those expressive eyes can get to anyone, but Cocker Spaniels, just like all other dogs, need to learn household rules and social manners. A well-trained, well-socialized Cocker Spaniel can be a wonderful playmate for kids. Sturdy enough to play yet small enough not to be overpowering, Cocker Spaniels will play with the kids and then take a nap curled up with them. 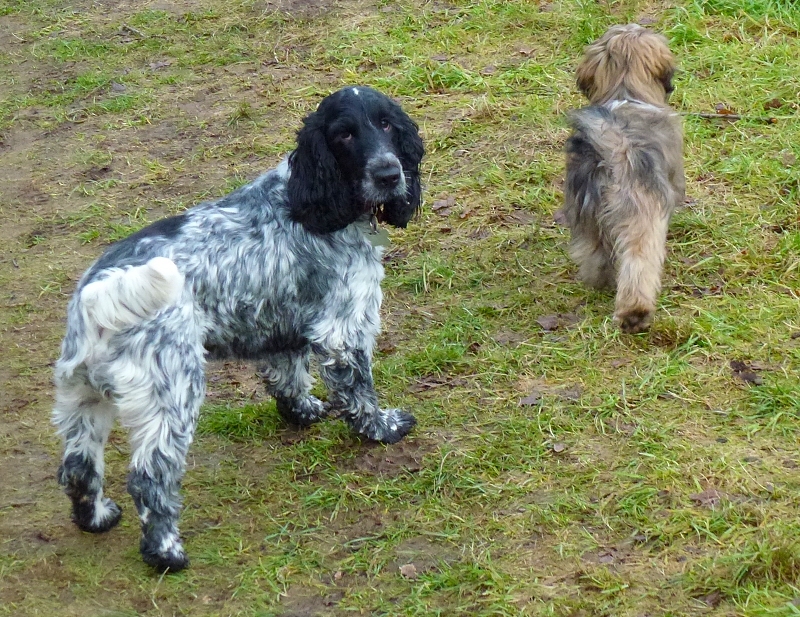 Most Cocker Spaniels are also good with other family pets, although interactions should be supervised; many Cocker Spaniels want to chase anything that runs. Major health concerns include eye defects, knee problems, cardiomyopathy, hypothyroidism, and hip and elbow dysplasia. Share your Cocker Spaniel story. Note: Upload only Cocker Spaniel picture or your picture with Cocker Spaniel below - spammer's ip may be blocked. With more sporting instincts than the American Cocker Spaniel, the lively English Cocker Spaniel likes more exercise. When well socialized, the English Cocker Spaniel has a merry tail-wagging nature and is sweet and gentle with everyone. Some are on the reserved side, and there is timidity and excessive submissiveness in some lines. This equable dog is responsive to persuasive obedience training that includes praise and food rewards. Unless taught to be independent, some individuals are so persistently affectionate that they become clingy and demanding of attention. Hello all dog lovers!! Cocker Spaniel is an impressive breed with distinct looks. When you will see a Cocker Spaniel pup you’ll want to have one.. But before you get one, do consider few things like his grooming and exercise needs.. this breed needs daily combing otherwise it wouldn’t take long before the hair get mats and messy.. also you will keep yourself fit if you go for those long walks that this breed needs and enjoys.. being from sporting dog family you will love training and watching him do agility exercises.. dbs has rightly mentioned that Cocker Spaniel need early training otherwise they can manipulate you.. We have a Lhasa Apso and Chihuahua and “Lady and the Tramp” fame Lady our Cocker Spaniel.. we all live happily together..